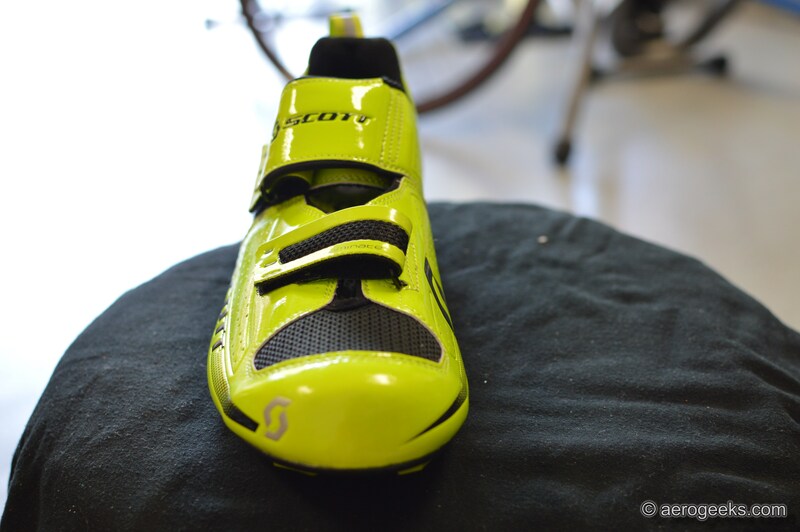 From the first time we saw Scott’s Tri Carbon Shoe we knew we wanted to try it. And we’re not going to lie, it wasn’t fully because of the strong claimed stiffness or because it looked really comfortable for long hours in the saddle. We wanted it because it was bright fluorescent green and would look awesome against our Cd0.1 test bike. But in this case, beauty is more than only skin deep. So this review will have to be about a bit more than flashy colors. 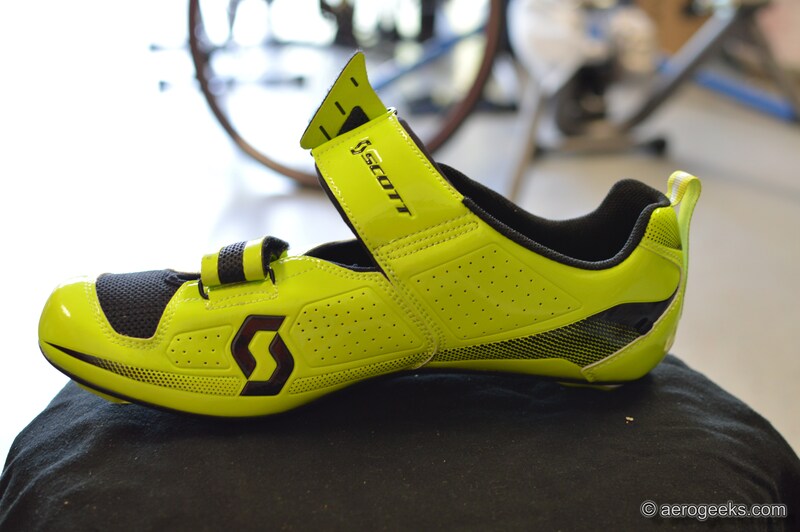 The Tri Carbon is Scott’s top-of-the-line triathlon shoe, and it shows from the moment you slip it on. 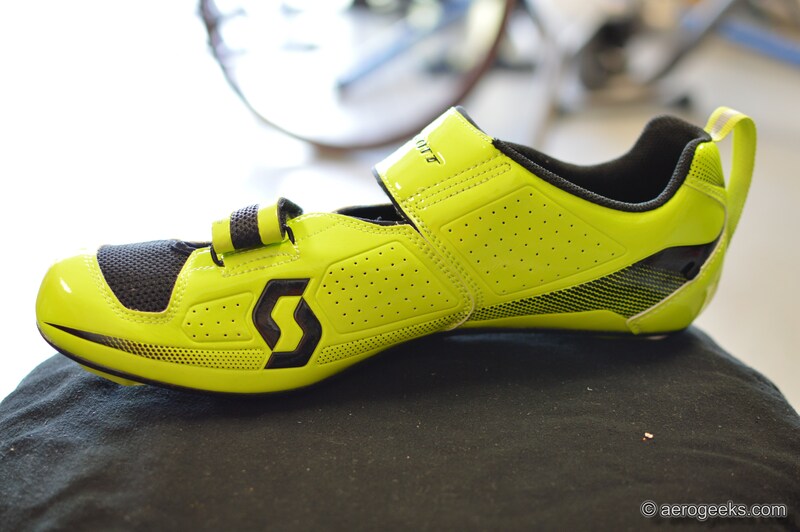 As we would expect from a high-quality shoe, the Tri Carbon excels in comfort, ease of entry, and stiffness. The ErgoLogic insole allows you to customize how the shoe fits to your foot – both the arch support and metatarsal button are customizable. Want a little less arch support or have too much pressure under the foot? You can easily remove the sole and adjust. The upper strap holds your foot firmly and comfortably. Even strapped tight, we never felt the material digging into our feet. The upper incorporates a structure layer of synthetic leather which conforms to the foot and helps provide a supportive structure free of pressure points. The Tri Carbons ventilate very well. The mesh above the toes kept our feet cool even on the longest and hottest of rides, while the drainage ports allowed excess water to escape during races or bricks. However, we did find that the ventilation may have worked a bit too well during the cooler months. We do all of our riding sockless, which left us longing for toe warmers when the temperatures dropped. The upper Velcro strap is easily setup for rapid entry when racing, and we found it to be the perfect length to easily grab and cinch tight. When we got to T2, the shoes came off quickly once the strap was undone. Overall, the shoe needed virtually no adjusting throughout our time with it. We set the lower strap just once and quickly forgot about it. 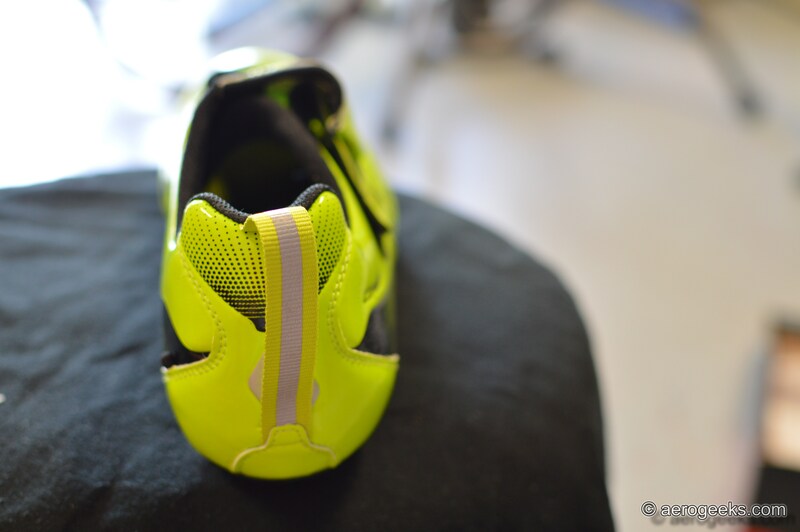 The rear heel loop also retained its shape throughout our testing period and was always easy to grab when needed. The shoes feature a 3-bolt design, which we matched with both Look Keo Blade 2 and TriRig Mercury pedals. The carbon fiber sole has a stiffness index of 9, and we found it to be one of the stiffer shoes we have tested. We never noticed any flex and it easily put the power down to the pedals. Whenever we start a review talking about flashy colors, even we get nervous. Is there more to love other than looks? Fortunately for the Tri Carbons, we need not judge them on their looks alone. 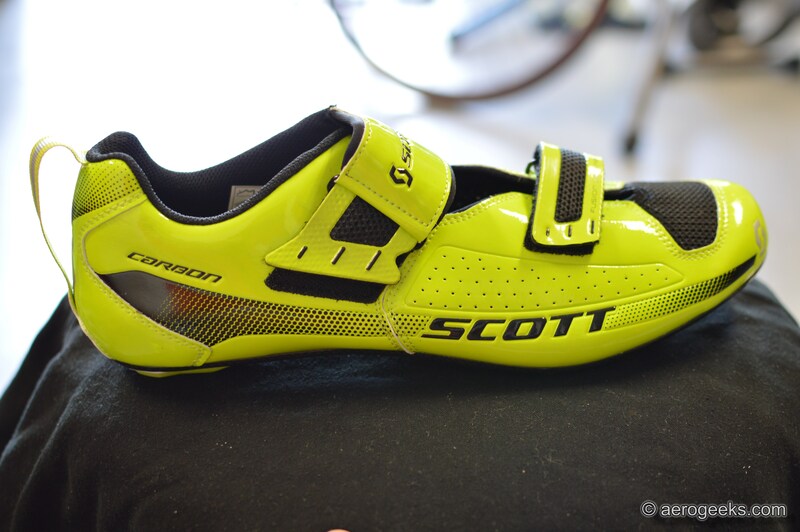 That’s probably a good thing considering that Scott has gone to a slightly more subtle color pattern for 2015. It still looks great; but let’s be honest, it’s not quite the fluorescent green we fell in love with. We rode and raced on the Tri Carbons for more than a year and have walked away all smiles. This is a fantastic shoe—comfortable for even the longest and hottest rides, easy to transition into, and helped us continue putting the power down to the road. Who can ask for more? Because even though we hate to admit it, flashy colors won’t do much to help you get to the top of the podium.